I like side-trips. Feeling ko nasulit ko na kaagad ang airfare when I'm able to go to different cities in one trip. What I like about Osaka, or actually Japan in general, is that it is easy to go to these day-tours because everything's accessible naman via their well-planned train system. But before the tips, here are some morning photos from our Day 2! Left our Airbnb early in the morning, as planned. Lagare nanaman with our maletas! Love taking tourist pictures of my friends "Sayang naman kelan ka uli babalik dito!" Before completely leaving, we looked for a place to eat lunch in Dotonbori. Our finale meal in Japan's Kitchen. Kuya Kim mode, I pointed to the different over-sized displays in every establishment, and told Sarah that these instantly show what food the restaurant is serving or kung ano ang specialty nila. We picked a random restaurant overlooking the Dotonbori Bridge, with surprisingly homey interiors. Outside, it looks like a karinderya. But they actually serve a good variety of food, and the restaurant is clean and air conditioned. Then finally, bye for now Osaka! A large city in Japan, Kobe welcomed me last year with a beautiful port area with amazing art and architectures. 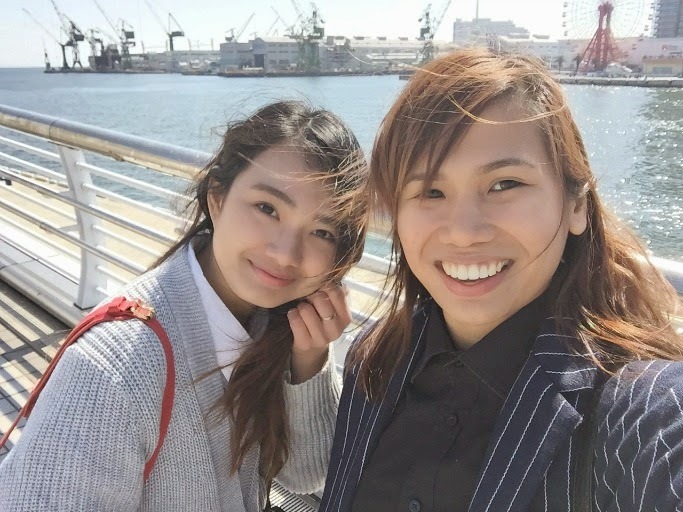 Some of the must-see and must-do in the city include trying the authentic Kobe Beef, checking out Kobe's Harborland and Meriken Land, strolling around their the western style neighborhood (even the Starbucks is so pretty there! ), and visiting the museums to learn more about the terrible earthquake that struck the city in 1995. Travel time from Osaka to Kobe is roughly around 30 minutes only. Take the JR Tokaido Sanyo Line, more of this HERE. 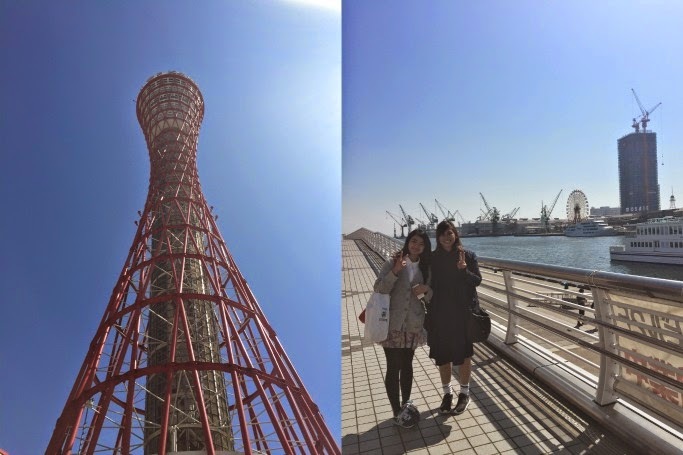 Went to Kobe with Ashley last Spring 2015. Read more on our day-tour HERE. Nara is interestingly Japan's former capital city. Being their FIRST permanent capital, ang dami-daming historic treasures na nandoon padin, including Japan's oldest and largest temples. But the highlight is the Nara Deer Park! Train ride is only around 30 minutes via Kintetsu Nara Line. More on the route HERE. Before we knew it, we're in another city in Japan! Preparing ourselves for the long walks! Our goal was to meet the deers and visit at least one of the temples. It's easy to navigate your way around Nara - signs are everywhere, and konting lakad lang from the station (just follow the tourists! ), may makikita ka na agad na deers. Okay, so very unlike Bambi and fairytales, these deers are not exactly tamed and demure. Sila na ang PG, palaging gutom! One even took the map that I was holding and munched on it till somebody took the paper from its mouth. Nakalahati nya yung mapa! Huhuhu! I also saw a deer that chewed on a tourist's plastic bottled water! Ang hirap naman suwayin, yung iba may horns na baka magalit pa sakin. So to be safe, just keep your things out of sight during your visit, mamaya cellphone mo na ang kainin nila, haha! Natatakot ako baka magalit sya sakin! Yun pala siya na ang pinaka chill na deer sa lahat that day! Deer: "Yeah, yeah! Just another day with the tourists! Ikaw gusto mo papicture?" Lol. Deers have different meanings in different cultures, but they are often associated with gentleness (WOW, hahaha). If your spirit animal is a deer, it means that you can go through life's obstacles with grace, and can adapt with change quickly. I actually like those traits. Meanwhile, in Japan's Shinto religion, deers are considered divine messengers to the gods. Check out my Nara visit last 2015 HERE. While others consider Kyoto just a day-tour from Osaka, I recommend you stay there for a night or two just to explore "old Japan" a bit more. The land of geishas, temples, traditional Japanese houses and gardens - there's just so much to see in the city! Click HERE on how to go to Kyoto from Osaka. We reached Kyoto late at night already, that we had a hard time navigating our way to the guesthouse (what's new, haha!). We asked for directions from random people walking the almost empty streets, and realized that the guesthouse is a bit far from the train station. Then finally, our home for two nights in Kyoto! Although we checked-in late, we were welcomed by the inn-keeper, an introverted guy who seems like in his early 20s. Ang konti ng salita nya, he just welcomed us and that's about it! Di ako sanay! From my past guesthouse experiences, inn-keepers were madaldal and ma-PR. They help us with our itineraries and ask us a bit about our country or how's our trip so far. Dito walang small talk small talk si Kuya! Lol. On our last day, Kuya was just sleeping in the common room at di ko pa magising, so iniwan nalang namin the keys by the door. It is not even irritating na to me, nakakatawa sya actually! The common CR, toilet and bath are separate. Honestly, di sya masyado clean compared to my Kyoto guesthouse last year na common CR din naman. Stairs heading to the rooms at the second floor, no elevator but Kuya helped me with my maleta. They only have two rooms at the second floor (or I think in the whole house), separated by a thin wooden wall. On our second night, hindi namin alam na may natutulog na sa next room so na "quiet please" pa kami ng di oras, haha nakakahiya! What I like about our guesthouse is the traditional tatami Japanese-style set-up so we slept sa floor with their provided sheets and blankets. Sarah said nangati sya the next day, huhu, so generally I think they need to clean the place more regularly. Meanwhile, room is big, and I imagine it can fit kahit isang small family or barkada! But take note: Iisa lang ang CR, at nasa baba pa sya! Haha! Over-all, it is an okay experience. WiFi is fast, thank God. I think natolerate ko sya because of the price, sobrang tipid siya we paid only Php 4600+ for two nights, divided by three pa yan! So imagine money-out ko was just Php 1500+ for 2 nights in Kyoto! Kakayanin ko na ang lahat, hahaha! If interested, check out their Airbnb listing HERE. Midnight snacking before we sleep! More on Kyoto on my next post!